Ilze’s Point of View is ideally situated on the top of a hill overlooking the Connecticut River Valley. 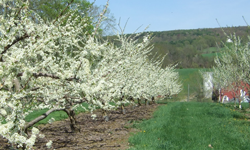 Set deeply within the orchard, your guests are surrounded by the inherent allure of Alyson’s – her many fruit trees, rolling acres and idyllic ponds. As they look out across the river and beyond the horizon their eyes are rewarded by the neighboring charm of Vermont. What bride would not shine even brighter framed by such natural beauty? If you prefer spectacular views of the picturesque farms of Walpole, consider Ann Marie’s Point of View. If a place of serene beauty in the pines is your desire, look no further than Martha’s Point of View. Perhaps a relaxing setting by a pond with fantastic views to the West sounds like the ideal site for you, then Sarma’s Pond would be your choice. 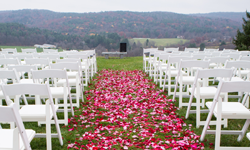 For smaller weddings, or winter ceremonies close to the reception hall, you might consider Rachel’s Pond. 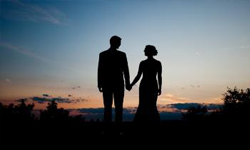 At Alyson’s we take care of our brides and their families. There is no need to worry about long walks in the white wedding dress or having your elderly aunt trek from one part of the orchard to the other. We are happy to provide rides to and from the site of your choice in our comfortable wedding wagon that is pulled by a John Deere tractor! Why should a wedding celebration be just one day? We at Alyson’s believe this time with family and friends should be savored. 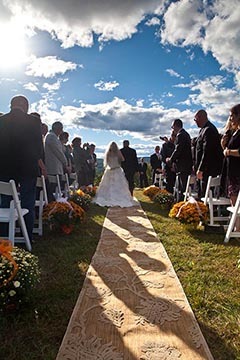 Come and see why Alyson’s is rapidly becoming the place in New England to enjoy a Destination Wedding. Take advantage of our incredible lodging facilities, invite your family and friends, and come make a weekend of it.